After decades of directors and studios taking on the film adaptation of Orson Scott Card’s ground-breaking and best-selling novel, Ender’s Game finally came to the screen with Gavin Hood (X-Men Origins: Wolverine) and Summit. 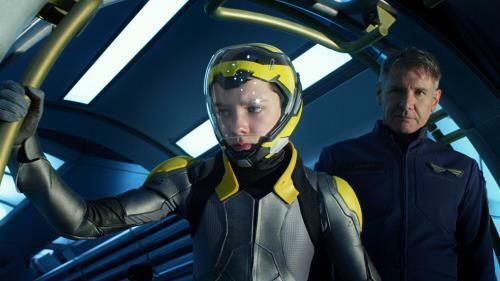 In the PG-13 movie, young Ender Wiggin (Asa Butterfield, Hugo) is recruited by the International Military to train to lead a fight against an alien race that nearly annihilated the human race in a previous invasion. Harrison Ford (Cowboys & Aliens) stars as the colonel who leads Ender’s training, Abigail Breslin (New Year’s Eve) plays his sister, Ben Kingsley (Prince of Persia: The Sands of Time) is a legendary fighter, Viola Davis (The Help) is the psychiatrist who helps Ender and Hailee Steinfeld (True Grit) and Aramis Knight (Crossing Over) are fellow trainees. Ender’s Game grossed $60.5 million at the box office, wowing moviegoers to a 74% approval, even if critics were a little behind that at 62%, according to Rotten Tomatoes. and digital copy and instant streaming via UltraViolet. Why has this not been released in 3D Blu-Ray?